Stoked in part by an exchange between the President and Jay-Z, the black unemployment rate is having its moment on the national stage. Standing at a historically low 6.8 percent in the December 2017 jobs report (though up to 7.7 percent in the January 2018 jobs report), President Trump cited the metric as an indicator of improved economic well-being within the black community under his watch. Notwithstanding the question of who deserves the credit (the rate has been falling, after all, since early 2010), it is more important to recognize that the unemployment rate alone presents a revealing but incomplete picture of economic well-being within any community. Citing it by itself is akin to your doctor using your weight, alone, as the key indicator for your overall health, when in fact several indicators are needed to give a full picture of a person’s health. To understand why, recall how the unemployment rate is calculated. Essentially, the rate is the number of people currently unemployed divided by the number of current worker plus those not employed who are actively looking for work. This measure ignores people who are not actively seeking employment, as well as the institutionalized. It is more important to recognize that the unemployment rate alone presents a revealing but incomplete picture of economic well-being within any community. The unemployment rate is therefore limited and should be considered alongside other measures of labor market strength. Let’s start by comparing the unemployment rate to the trend in labor force participation. 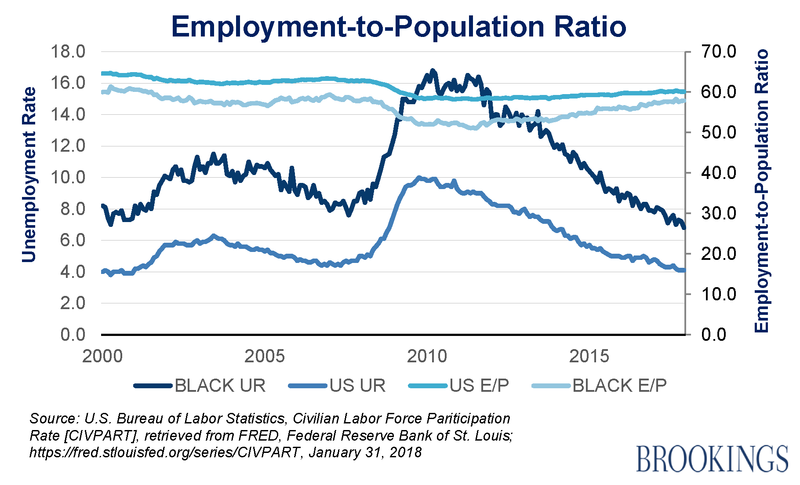 Below, we first plot the national trend in the black unemployment and labor force participation rates against overall trends for the U.S. Next, we create a similar comparison for employment-to-population ratios. 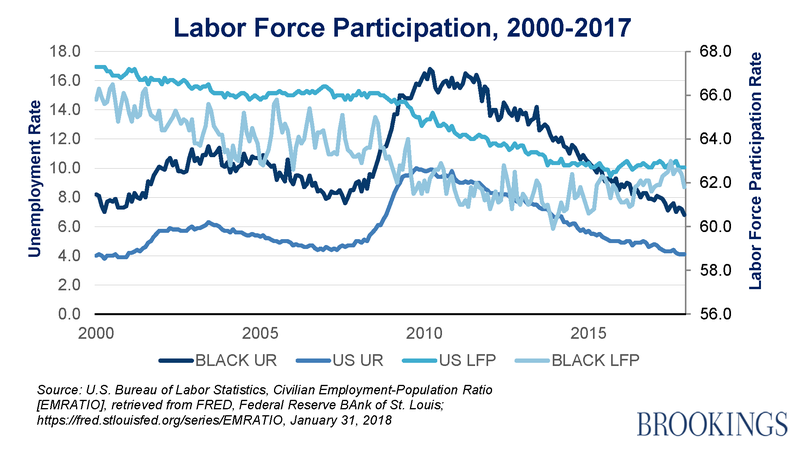 Despite improvements since roughly 2010, black unemployment is persistently higher and labor force participation is lower, relative to both whites and the overall population. Nonetheless, there is some partially good news here: While trends in labor force participation and employment-to-population for the U.S. as a whole have largely flattened in recent months, these trends continue to improve among African Americans. The trends thus suggest that more working-age blacks are employed or feel hopeful enough about their chances in the labor market to join the work force. Ultimately, however, working and economic well-being are determined by income. What is the level and trajectory of black incomes given the observed increase in employment? 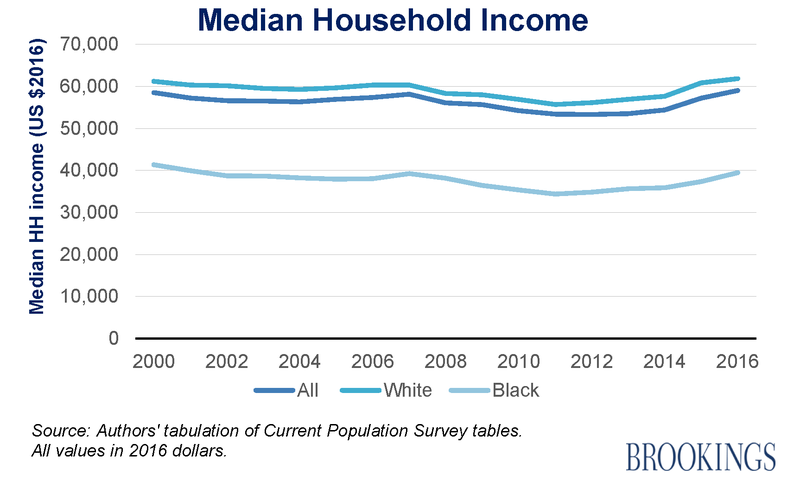 We still see that large gaps in median household income persist between blacks and the rest of America, suggesting there’s little evidence that improved labor force participation and decreased unemployment have helped to lift the relatively low incomes of black American households. To consider how this can coincide with improvements in these other labor market metrics, it is important to identify where job growth is occurring in the U.S. Recent evidence demonstrates that the labor market is increasingly polarized. Employment growth is occurring within lower paying jobs that do not require advanced writing, computation, or creative skills commonly associated with college and graduate school educational attainment. Many of these jobs pay such low wages that workers qualify for benefits such as the Earned Income Tax Credit and the Supplemental Nutrition Assistance Program. Given this, labor force statistics should be paired with information on income to better understand black economic well-being. Notably, continued improvements in the black community may even result in both the unemployment rate and wage gaps ostensibly worsening for blacks—at least initially. Why? As discussed above, a stronger labor market tends to induce selection into the labor force among previously idle and discouraged workers. Given historical structural factors, as well as gaps in education and measured skills, this may mean that additions to the labor force from the black community will likely be disproportionately among lower-skilled workers. Although these data provide a cautiously positive outlook for employment within the black community, increased work, by itself, may not be enough to improve overall community economic well-being. The bottom line is we need to practice caution in interpreting the unemployment rate (or any other statistic) in isolation.